Hey everybody. I’m back in the writer’s seat after a holiday break, a birthday, a new year, the last semester of my undergraduate education, and just a ton of tumultuous activity that has had me on my toes for the past month. I hope the new year has found everyone well, and that you haven’t abandoned all hope in my blogging practices. Also, my camera broke, so I don’t have a bunch of good pictures or anything like that. I should invest in one. I don’t even have any on my phone. However, other people have taken some pictures, so I’ll post those. January was a pretty busy month for me. Some of you may know that I will begin teaching a course that I’ve developed on music production for DJs at The Lab. I’ve officially dropped the “-tern” from my position at The Lab and upgraded it to “-structor.” My boss Zack has been in Thailand for the past month, so little progress has been made as far as incorporating my teaching into The Lab, but when he gets back, expect big moves. More news on that as it comes about. 101 is still continuing at Rasputin’s. 101 started last September, and it’s been successful enough to where the club is staying open on Thursday nights for DJ Dan and my night downtown. I’m pretty proud of that. Whether it’s a testament to Dan’s or my skills as DJs or the fact that it started the 18+ night trend that’s going on in Burlington remains to be said. Regardless, I’m happy with the outcome, although I have been told by the club owner that my music selection doesn’t include enough top 40 tracks, and tends to linger around beats per minute that are a bit too fast for the crowd (Around 120ish). That’s fine though, I’m gonna have to think of something creative so that I can still improve as a DJ and please the crowd because without them, there’s no 101. One unfortunate thing about this Spring is that I decided not to have a regular show on WRUV, and try to end my senior year of college on an academic high-note. So folks, there’s no more Beat Therapy presented by Pres, but there is still Beat Therapy presented by B-Fish, Conor McKeon, and Ben Hallowell on Champlain Wave Radio. Check it out Thursday’s from 7:30-9:30 http://radio.champlain.edu. Aside from the many Thursdays that there were at Rasputin’s this past month, there were also a couple of new buddies that I made through old buddies. One of which is the Broke In Burlington team. 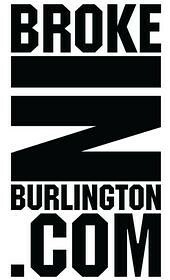 They promote a bunch of parties and events for people that live in Burlington, VT, but might not necessarily have a ton of money to fully enjoy the town. They originally hired Miles Ewell (of Principal Dean Productions) to DJ the gig, but since he doesn’t DJ, he kindly passed it on to me. As a result of this kind gesture, I had my Nectar’s debut through Broke In Burlington (albeit I was DJ iPod Replacement, but a gig’s a gig). I would go on in between sets, nothing too stressful or huge, but it was still a lot of fun. The Broke in Burlington people are definitely all good in my book, and the showcase event was very cool. The idea was to get a bunch of different acts from the many different aspects of the music scene. The acts that played during the showcase included: Meek Sol, The Fever Breakers, and The Mathematicians. I only really got to hang out with The Mathematicians, but all of the bands were different from each other and are worth checking out. In addition to the gigging in and out of town, I have been busy making music for myself and others. I have talked about how I have been producing music for the game Planck for Matthew Burns, and the second version of Planck is underway. With Planck v.1 came some modifications to the team, and with feedback from judges from the various game conferences that it was submitted to, it is turning into something completely new and awesome. We have made changes to the game engine, art direction, musical style, and level design. Everyone is on the same page, and everyone is really excited to get it out and into your hands. The development progress is being documented HERE, and if you have any questions that you’d like to ask the planck development team, you can hit us up on twitter. My musical focus hasn’t strictly been on videogames, however. DJ cRAIG mITCHELL has asked me to remix the track “I Wanna Live.” I have been working on that for him, and I’m totally pumped to get that out of my computer and onto the dancefloor. It’s shaping up rather nicely, if I do say so myself. I’ll post it as soon as I can. Last but not least, College III (tentatively titled), is going to start production rather shortly. I am finishing up a video for one of the tracks on College II, and once I make the announcement of the beginning of the end of the College trilogy, I’ll post it up for you all to enjoy. It’s hard to believe that a year has just about gone by since the release of College II.